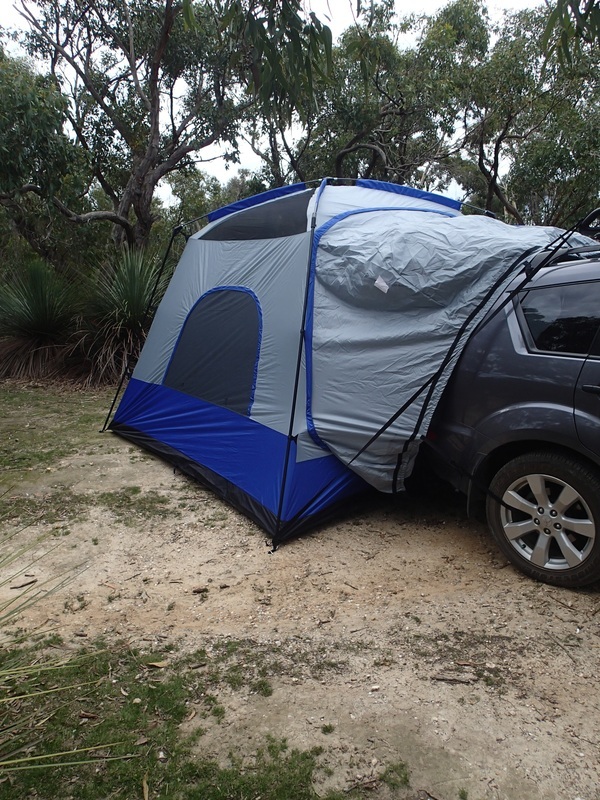 When we were given an opportunity to review the Napier SUV Tent (with Screen room) #84000, we were intrigued. This tent is larger than any tent we currently own, and has the added feature of being able to be attached to your SUV. That is what makes this family tent different to others on the market – the ability to use the back of your vehicle as a cargo area/storage area (or even another spot for someone to sleep) but you can access your car from within the tent. As a family that seems to carry a lot of gear, and always running back to the car for something stored in the car (and not in the tent), could the Napier Outdoors SUV 84000 be the answer to our storage issues? This is the biggest tent we have tried. We have put up our fair share of tents, but this tent came with the attached screen room, and the ability to attach to our car (so that was a whole different side of a tent we hadn’t seen before, with straps etc). The tent comes in a bag (with ability to expand the bottom to give you more assistance in getting the tent and accessories back into the bag at the end - doesn’t help a lot, but a nice thought), and its heavy. Getting on top of a roof rack might be a little challenging, but its small enough bag to fit in the rear of your SUV. Instructions are included, and they are helpful and straightforward, and once we got used to the size we were working with, it was a fairly simple process, but its definitely a 2-person job. The fly covers the tent only (not screen room), and once again, 2-person job to get it on. Set up time, was around 20 minutes – which is pretty good for a first time and I think we will get faster now that we know more about the tent. You do need a good sized campsite if you plan on utilizing the option of having your car attached to it. But more on that later…. Storage - 2 Interior Pockets, Gear Loft, Lantern holder and Carrying Bag. This is a spacious tent for a family of 4-6. We are a family of 4, so it’s a good size for us in the main tent area, and I wouldn’t want any more in there with me, but you could add a couple of more, especially if they are children. Regardless of my preferences to not have a lot of people in a tent with me, this tent is an excellent size, with 2 small pockets and a gear loft. 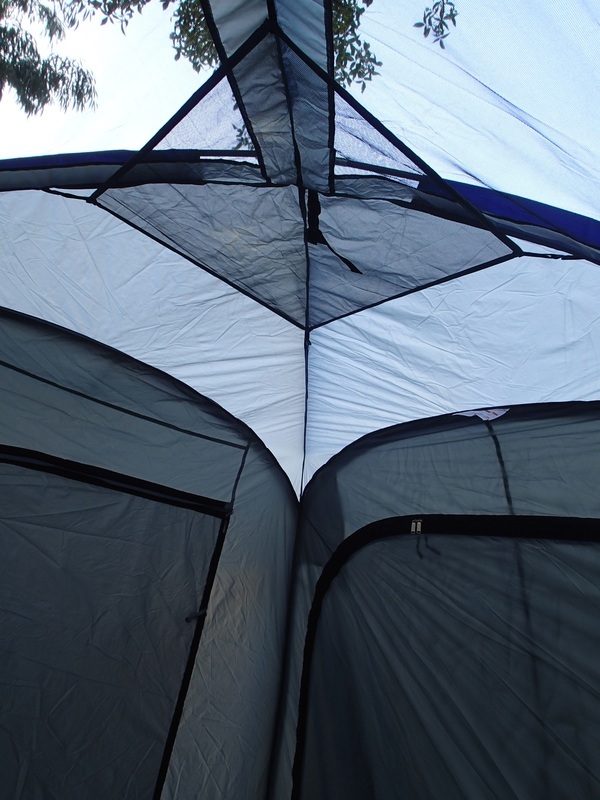 In this tent, no one will be hunched over due to the height of interior. Its 7 foot in the centre, and the gear loft was anchored in the centre of the tent, so it’s a struggle to reach it (I would prefer to have more small pockets down low, than have a gear loft, especially one so high). There is a large door; with an awning available for use/setting up should you need it (attached to the large D shaped door, so not flapping around when not needed or not in use), plus another door leading to the screen room. There is access to your vehicle on the 3rd side of the tent. So plenty of access points. Ventilation: Very good with 2 mesh skylights. This is as described: a screen room attached to the main tent. This would be a good place to set up away from any mozzies/flies and all screens do have zip up privacy panels. There is no flooring in the screen room. This is removable from the main tent. Not that we noticed that on our first outing with this tent. It looks so much part of the main tent; we thought it was all joined together. If you didn’t think you would use it, especially in cooler weather I could see why some people might want to remove, but I loved that option of another room and we are definitely going to keep it on. All the steel poles and fibreglass poles are shock corded which is good, as nothing worse than putting together poles and fiddling with that! They appeared to be strong and well built. Tent material is Polyester Taffeta and the floor material is polyethylene, but you do need to seal the seams prior to use . (FYI: Seam sealing is treating the stitch holes and seams with a commercial sealant for waterproof materials. 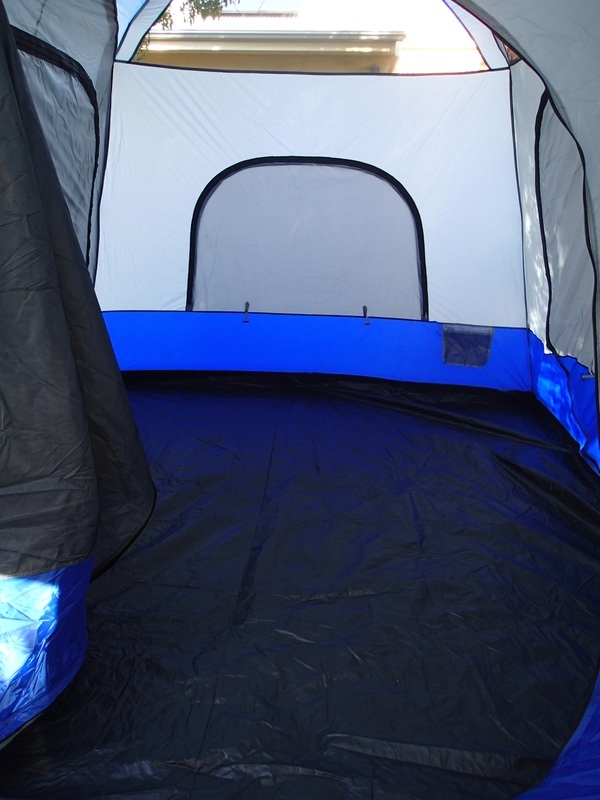 By treating the holes and seams, you prevent leaks and drips coming through, onto you in the tent). It’s a bit of a painful chore that you will need to do on a sunny day prior to your camping trip - would like that to be done prior to purchase. The material is pretty typical of tent material. If you are used to canvas, you might be surprised how light this feels. The plastic clips for the rainfly – don’t appear to be the strongest, so I would use caution when attaching them to the bottom poles to lock the fly on. Definitely a weak point in construction. What makes this tent so different to other family marketed tents is the ability to attach your SUV to the tent itself. You don’t need to own a SUV to own this tent but consider it another option to your camping. 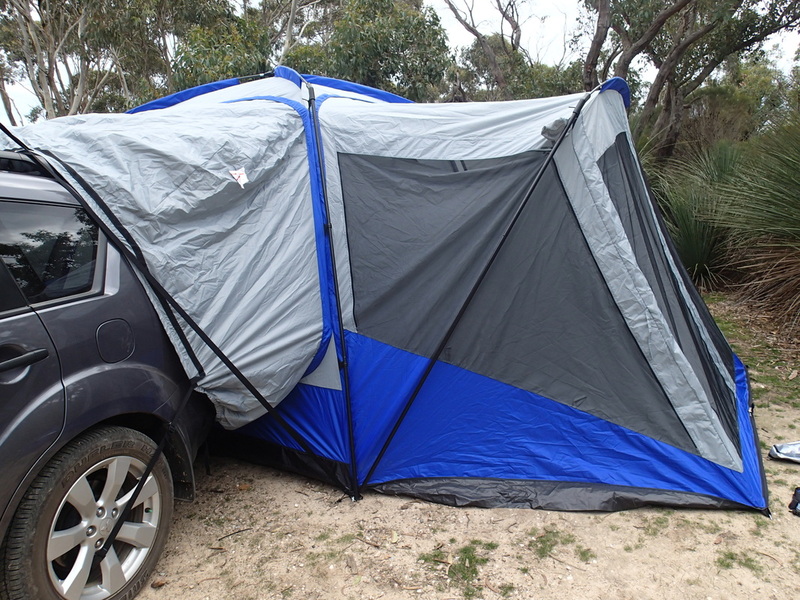 Make sure your car has cooled down completely from the trip before attaching the tent. You don’t want the tent material near a hot exhaust. The instructions for this aspect of the tent were adequate - we had rain threatening, so we didn't have a lot of time to study this part of attaching to the car. I don’t think we got a great fit to the car – there was still some flapping around when the breeze caught this section of the tent. More practice for this aspect of the tent by us. The strap work by us does need refining and study. I have seen other photos of this tent, with SUV attached, and it looks way better than how we did it!!!! Its a bit fiddly. At night time, for security of the car (and because we hadn't attached the tent to the SUV properly, there was a bit of a gap where bugs could get in), we could easily shut the boot, and then zip up the vehicle side of the tent - without having to move the car, and giving us a bug-free tent. In the morning, we unzipped that side of the tent, and opened the boot of the car once more. Below is the SUV attached to the tent (the screen room is the main part of the tent visible - all the privacy flaps are up). Taking down the tent - is it difficult? I think for anyone who has to put up a big tent for the first time, in the back of your mind, you are wondering if you will ever be able to get it all back in the bag again! The dis-assembly of this tent was speedy and no problems were encountered. Getting it down, it’s a 1 person job. Placing the tent in the bag, we used the length of the tent pole storage bag as a guide, and folded the tent roughly to that size. Two provided straps held it all together, and we got it in the bag more easily than we thought. Very happy with how fast it all came down and got put away. 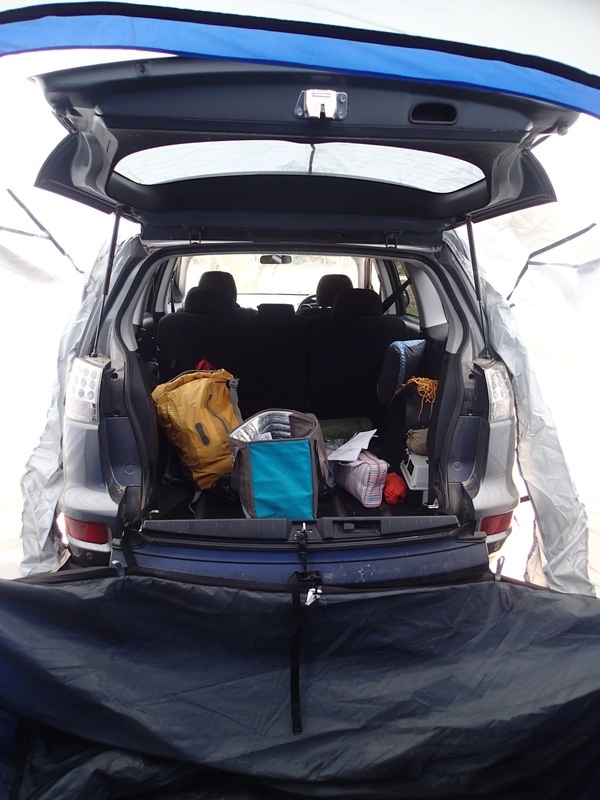 I really like the spaciousness of the tent – and for a family, it provides a lot of space, especially with the ability to access the car (and use the car as a storage option for clothing, toiletries, personal belongings). The screen room provides more relaxing space and can be used as an eating area or spot for your camping gear (not food – don’t store food in a tent!). Our current tents don’t have this, so for me, it was a cool feature! A large awning gives another spot to sit by the tent. After spending a lot of time in backpacking tents, all this space is surprisingly enjoyable. The car being attached – it’s not mandatory to use this option. Our first time, we didn’t. It’s an option that is good to have, providing another area for storage or even to put a mattress in back of the car (if you can), but you don’t need to use it, and I like that ability to pick and choose. It zips completely off, if you don’t think you would use it for your trip – that is a great feature! The manufacturers have thought of all scenarios with this tent and have come up with a versatile tent. Your campsite might not always be able to accommodate this sort of set up, so you don’t have to feel compelled to choose a spot that allows the SUV to be part of your camping set up. It won’t always be practical to use this tent/SUV set up and would be limiting on the positioning of your tent in a campsite. Looking at the SUV (attached) from inside the tent and our messy car! If you are used to putting up bigger tents, then this tent will not be a problem at all. But, for 1 night only, it’s a big tent for us to take. Generally, a dome tent would suffice for an overnight trip. In saying that, if you had a very young family, then I could see the benefits of using a tent of this size. Younger children have some different requirements and you may have to bring along cots or playpens, and this sort of tent allows you to use this baby gear and not be crowded. Its going to come down to your own personal preference – and how much time you want to commit to putting up and pulling down. It's more a tent for a longer stay than a quick getaway. I think the screen room could do with a few more anchor points to stop it flapping around at the base. Believe its better to have more options to peg out a tent than you need, than not have enough. Some clips on the poles to hold the screen to the pole (as the main tent does have) would also be beneficial. The bottom of the screen room showed wear and tear after a couple of outings. The tent is noisy in windy conditions. There are not enough guy rope anchor points anywhere on the tent and the wind just seems to grab the tent and rattle it. I was very impressed with the versatility of this tent. To have rooms or features added or taken off based on your individual needs is a great selling point. I thought that we would need to always use the SUV attachment (or as we called it, the birth canal – looked like the tent was giving birth to a SUV), but realised that was not the case. Zip it off, if you find that you don’t need it on a trip or don’t think you will. The same with the screen room. Update: During a storm this tent didn't cope very well - without guy rope anchor points, it couldn't survive upright with the strong winds and unfortunately collapsed on us. Best suited to mild conditions only. 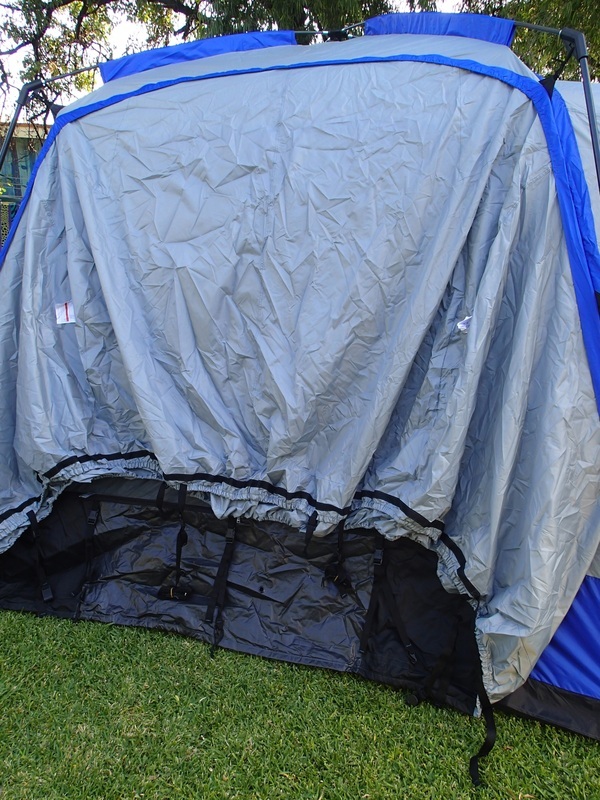 This tent was gifted to Go Camping Australia for the purpose of this review. We thank Napier Outdoors for allowing us to try it.